I don't know how it happened really, but some how the whole world of Arthurian literature has really passed me by. Before starting this trilogy, the only Arthurian novel that I had read was actually a romance version, which didn't really work for me. Maybe it was because I didn't tend to read a lot of fantasy for many years, or maybe it was that the story is so familiar that I didn't feel like I needed to read the books. 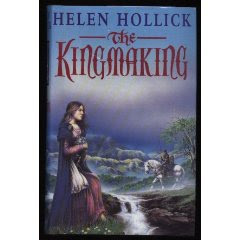 I am not sure that I really was even all that aware that you didn't have to read fantasy to read about Arthur but rather historical fiction which is the case with the excellent Pendragon's Banner trilogy by Helen Hollick. In the end it was more that I had read and enjoyed another book from her and wanted to read more that made me want to pick up the first book in the trilogy. The year is 450AD. Uthr Pendragon's ship arrives at Gwynedd, kingdom of his old ally Cunedda: together, Uthr and Cunedda intend to oust the tyrant Vortigern. But when tragedy strikes, the British are left at Vortigern's mercy in a country in chaos. It is a boy, Arthur, who is destined to lead them from this darkness into a new age of light. Protected since birth by a false identity, he is revealed as the new Pendragon. But Arthur must serve a hard apprenticeship in the army of his enemy before he can lead his country and his goal, to regain his kingship and win the hand of Cunedda's daughter Gwenhwyfar in marriage, seems to become ever more distant. And the beautiful and spirited Gwenhwyfar, pledged to Arthur since childhood, finds herself a pawn in political games controlled by powerful figures. Ever a fighter as a tomboy child, as a woman she must call once again on her strength of spirit to defend herself against her adversaries. Full of the romance and excitement of Arthurian Britain, and a throng of colourful characters, The Kingmaking brings alive in all its glory and splendour an era long shrouded in the mists of myth and mystery. I wasn't 100% sure what to expect when I started reading this book. Vaguely I was expecting the story that we have heard before - Arthur, Guinevere and Lancelot, Merlin and the Knights of the Round Table. What I got was so much more. When the reader meets this Arthur, he is a young boy who believes that he is a servant to the powerful lord Uthr who comes to Britain as part of a campaign to reclaim his throne. Uthr's mistress is the evil Morgaine, who doesn't understand Uthr's attachment to the young boy, but who is nonetheless jealous of the relationship. When Uthr is killed, the truth is revealed and Arthur's true identity is revealed. The antagonism between Arthur and Morgaine continues, but now he has an ally in the daughter of his host Gwenhwyfar, and he is coming into a position of power. After initially not liking each other at all, Arthur and Gwenhwyfar forge a strong emotional bond. However before they can be married, Arthur must learn how to lead men, how to fight in battle. In short, he must learn how to be a king. To some degree the legends about Arthur show him to be the ultimate in honour, but the Arthur that Hollick brings us is one who is far from perfect. He drink too much, enjoys the women a little too much, is brash and abrasive and determined to be the King of Britain at almost any cost. Yet he also is extremely brave, strong and charismatic, and it is these qualities that leap off of the page. The intervening years are not kind to Arthur and Gwenhwyfar. She is a political pawn, and finds herself in betrothed to a man not of her choosing. Misunderstandings ensue and Arthur finds himself manoeuvred into a marriage with Winifred, daughter of his chief rival. The marriage is doomed from the start, with the young couple barely able to be civil to each other, and when Gwenhwyfar reenters the picture it is only a matter of time before the marriage is over. I have mentioned some of Arthur's qualities, so it is only fair that we spend a little time on his fair lady. Gwenhwyfar has grown up among a passel of brothers, the indulged sister and daughter, and is something of a tomboy. That grounding forms the basis of a warrior like princess, one who will literally stand by her man regardless of the danger that might place her in. Like Arthur, she is written with flaws - impatient, easily angered, and her relationship with Arthur is definitely volatile. She does also inspire great loyalty from many of the secondary characters. If there is one small flaw in this novel it is that the bad guys are a little bit one dimensional, but it is a small issue in an otherwise excellent novel. Three years have passed since the mists cleared to reveal the Pendragon Banner triumphant. Arthur is king. but the crown, once one, must be defended. He is a man about whom legends will be told. 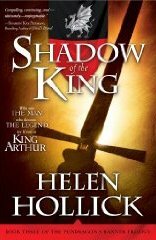 With his loyal and fiercely valiant wife Gwenhwyfar by his side, and three sons to his name, twenty-four-year-old King Arthur takes on the burden of a country battling for its very soul. But before the harpers sing of glory, before the tales of brave daring and skill, a young man must win his place as the greatest warrior of all Britain...and the greatest king of all time. As soon as I started reading The Kingmaking, I knew there was no way that I was going to be able to not finish this trilogy. Usually when I finish a book, I will start a post in draft and write a few thoughts about the book which will be the basis of my review if I ever actually get around to writing it. When I finished this book, I wrote only one word, which isn't overly helpful as I try to write this review now, but I do believe it probably conveys my thoughts about this book fairly well. What was the word? Arthur is now king of Britain, but that does not mean that he is living a settled life. As head of the Artoriani, he needs to be constantly on the move dealing with any security threats from their enemies, making peace with some of them, constantly on the move. He is always manoeuvring politically. For his wife Gwenhwyfar and their children, this means that they too are in effect without a home to call their own. In other domestic matters, Arthur is also under pressure. His ex wife Winifred is still doing her best to undermine both Arthur himself, and the peace and security of the country in order to manipulate the political situation to her own advantage. If she cannot be the wife of a King then she will be the mother of a king. She is therefore doing everything in her power to ensure that her son, Cerdic is declared the rightful heir to Arthur despite the fact that he has children with Gwenhwyfar. Between those lords who oppose Arthur because they have their own ambitions, his scheming ex wife and those who would like to return the country to Roman ways, Arthur has a lot on his plate. For a man who is at his best when leading his warriors in battle, this can be a difficult day to day existence. Once again, there is no whitewashing of the kind of man that Hollick's Arthur is for modern sensibilities. He continues to cheat with various women, he can still be bad tempered, impatient and impetuous, and his relationship with Gwenhwyfar continues to be volatile. When tragedy strikes, it could bring the royal husband and wife together, or it could tear them even further apart. This Arthur is a warrior king, and the author does not spare the reader when describing the battles, verbal and physical, that are portrayed within the novel. Once again, the writing is compelling, the story is one that keeps your attention, and the book is an excellent read as a result. Britain lies uneasily at peace, and Arthur Pendragon, King of Britain, is secure in his stronghold in the heart of the Summer Lands. Ever the fighter, he defies the advice of his wife Gwenhwyfar to sail for Gaul to defend his territories in Less Britain, leaving his country vulnerable and leaderless. When word comes that the Pendragon has fallen in battle, Gwenhwyfar, at Caer Cadan with their small daughter, faces overthrow by the powerful council headed by Arthur's uncle, anxious to reassert Roman ways. She must struggle to assure a future for herself and her daughter, opposed also by Arthur's ambitious ex-wife Winifred, keen to advance her own son, Cerdic, as the rightful heir. But, unknown to Gwenhwyfar, events abroad mean a far mightier battle for the Pendragon throne - and the very future of Britain itself - lies ahead. In this final part of the Pendragon's Banner trilogy, Britain has been enjoying a period of relative stability under the guiding hand of Arthur. Even at home he and Gwenhwyfar are happy, that is until Arthur agrees to travel over to Gaul to fight against the Gauls. With Gwenhwyfar and their young daughter agreeing to remain in England, and with Arthur's uncle at the head of the governing body, Arthur travels over the sea in good faith, not realising that he has been duped into a confrontation that is far more than just one battle, and that will take him far from home for a very long time. With his army bolstered by large numbers of inadequately trained men, Arthur faces battle in unfamiliar territory. When he is critically injured in battle, his men return to Britain believing him to be dead, leaving a grief stricken Gwenhwyfar to pick up the pieces. Here a face from the past returns and is the person who looks after Arthur, nursing him back to health, but it is not the Arthur of old. His injuries are so severe that he can not remember exactly who he was or the position he held, to the point of even not remembering his wife. Gwenhwyfar refuses to believe that Arthur could be dead, but her position of Queen without him by her side is tenuous to say the least. Arthur's uncle Ambrosius wants to be the next leader of the country, but also jockeying for position is Arthur's former wife Winifred and their son Cerdic. For Gwenhwyfar, it seems the only option available for her is to move on. She needs a new man in her life to safeguard her own position and also that of her young daughter. But moving on is difficult when you don't quite believe that you have to. Once again, the events portrayed in the novel can be violent and disturbing, and yet at other times, moving and powerful. The one thing that I couldn't do was read any of the books in the trilogy without being emotionally involved. If I have to give a one sentence summary for the trilogy as a whole, I would say "For all that I thought I knew the vague details of the Arthurian legend, the Arthur that I met in the pages of this trilogy was a very human man, and it is a telling that I will not forget any time soon." Ah those look worthy of a look. One can overdose on Arthurian fiction, its really something thats been done to death across a range of mediums. One series which I started but never found the rest of the book for were by Jack Whyte - The Singing Sword was his first. It had a distinctly Roman flavour IIRC. I haven't read too much on Arthur, the one that sticks out is Marion Zimmer Bradley fantasy, The Mists of Avalon. I really enjoyed these as well, but the last did drop off for me. Perhaps I read them too close together and should have spaced them out. I'm looking forward to reading these and hope to start the series sometime this year. After slogging through Jack Whyte's series over the last year and a half, it's definately time for some hopefully more interesting Arthurian fiction! Daphne, I hope you do get to try them and enjoy them. I have Jack Whyte's books on my list but I am not sure if or when I will get to them. My next taste of Arthurian fiction will either be Anna Elliott or more likely Mary Stewart. Misfit, the third book was the weakest IMO too. Blodeuedd, I know that you are not alone. There are a few people around who didn't really like them. Leya, I haven't read Marion Zimmer Bradley and I don't really have any desire too. I am not really sure why I don't. Sean, there does seem to be a lot of Arthurian fiction out there. Thanks for stopping by. I recently won this set of books in a giveaway, and am really excited to give them a try. I have read such good things about them, and I am glad to see that you are a fan too! I loved this series....it's one of the few that I've kept for my permanent shelves. I keep planning on reading Stewart's series, too, just for comparison. i've herad great things about this author! I adored this series too. Book three was the slowest and did wander a bit but still great. I think she's done a pirate series that I keep meaning to look for. Love the covers. I read the Second book and completely agree. Arthur was made much more real to me, as were all the characters. Gritty and savage, but that's the way things were back then. Hollick is an excellent story teller. Glad you enjoyed them all. I actually would like to read her back list some day...when I have a chance. I really enjoyed The Kingmaking but haven't finished the series. Maybe someday.